Camp Kintail has a large number of activities to offer. To discover more and decide which activities might be best for your group please have a look through the options below. Please contact us if you have any questions about the activities, or if you have any specific activity requests that you don’t see listed below. Adventure sessions at Camp Kintail are a great opportunity to bond with the rest of your group. By participating in a variety of games and activities, participants work on improving their teamwork and communication skills. Whether it’s working together to keep the parachute open, achieve a better group time in the hula-hoop race or doing your best to defeat the time machine, adventure is full of fun activities for participants of all ages. We have a large number of portable elements and many permanent elements in the forest which are described below. Working together participants try their best to get all members of their team through the Spiders Web without having any contact with any of the web and waking the sleeping spider. Stand in a line and reverse the order. Sounds easy enough, right? Well, give it a go on the tepee shuffle, a log raised 6 inches off the ground, and you may think differently. Like the Amazing Race on TV, small groups of participants will navigate around the Camp Kintail site, solving problems or completing tasks to gain as many points as possible in the time provided. Success requires teamwork, communication, problem solving and decision making. The tasks might be timed or scored and you won’t know where your team is in the standings until the very end. Archer y has become one of our most popular activities over the past number of years. If you are interested in perfecting your bow and arrow skills? Then come check out Camp Kintail’s archery range with instruction from our trained staff. With the latest safety features and experienced staff, Camp Kintail offers the full archery experience. Come and participate in our exciting challenge and compete to earn the title of ‘Sharp Shooter Cabin.’ Can you hit the bull’s eye? 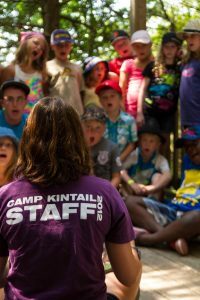 Whether it’s making friendship bracelets to share with new friends, painting rocks with scenes from around the campsite, or discovering the joys of creating personalized candles that can later be used during devotions, Camp Kintail offers a plethora of Arts and Crafts activities to choose from. Camp wide games are what we call games like capture the flag. 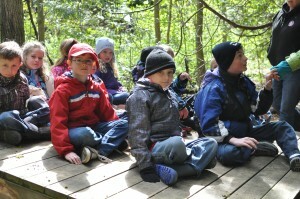 They involve your whole group in one big game using a large part of the Camp Kintail site. We have numerous games that we can play with any age group. Singing together around a campfire (with s’mores) is a great way to end the day. Camp Kintail staff will lead a variety of songs to sing along with. It’s a great time for the group to come together, share stories and talk about the fantastic day they have had. Try out our 18 hole disc golf course! Disc golf is played like golf but with special frisbees instead of clubs and golf balls. We have a full 18 hole course with score cards, signs for each hole with distance and par listed. It’s great fun. You can play for fun, keep score or go for the always popular speed round. We have a selection of prepared environmental education activities, linked to the Ontario curriculum. For more information please check out the Curriculum Links page. Gaga ball is a fantastic variation of dodgeball that is popular with kids from 3 – 73 years old. It is a faced paced game played in a confined space. If you get out, a new game will begin just as you start to catch your breath. At Camp Kintail we have a large garden that we use to compliment the meals we serve. We regularly have produce from our own garden on the salad bar or as a part of the meal that is being served. We also use the garden as a teaching and learning opportunity. Participants will have the opportunity to learn what it takes to grow your own food, what plants need to grow, the concepts of eating locally and environmental sustainability. We have many geocaches places around the site that can be found with one of our several GPS devices. Kids love to find the hidden objects and record what they have found. If map and compass is more your thing we also have an orienteering course that exists alongside the geocaching course. Kids can learn the basics of using a map and compass while exploring the Camp Kintail site. You will be amazed at how quickly the children will pick up the skills to navigate around the site and find the hidden locations. 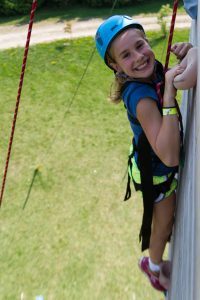 Camp Kintail has an extensive and well planned vertical component of our challenge course. Camp Kintail began offering climbing on our outdoor three sided rock climbing tower in the summer of 2010. 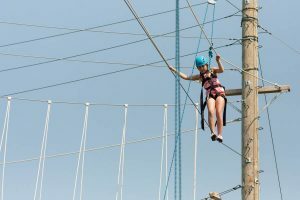 The traversing high ropes elements and our 100m zip line were added in the fall of 2012 and a new 4 pole adventure tower and the Flying Squirrel were added in the winter of 2015. The high ropes course is on 50 feet poles, and includes a 330 foot zip line. At Camp Kintail we believe that everyone should have the chance to experience all activities that we have to offer. To further this we have an accessibility package with specialized equipment so that anyone with any ability can be access the elements and participate in the high activities. All of these activities are attempted in the air, with dedicated staff and safety equipment. It is intended to be challenging and exciting, and to help groups to communicate and work together. Individuals will be challenged and will try things they couldn’t anywhere else. We are excited to see our school groups and campers taking the leap of faith to try out the high ropes. Our trained and experienced staff guide campers through the safety procedures and teach proper climbing technique. After double checking all ropes and equipment, campers are encouraged to climb. Our rock climbing tower has three sides with six uniquely challenging routes up the wall. Success on the rock wall is not determined by how high a camper climbs, but the accomplishment of reaching their individual goals. There are six climbing routes on our tower, with increased challenges for returning campers. For younger campers, the bottom of the wall is often used as a bouldering wall and they get to participate in the excitement of climbing (just close to the ground!). This individual activity is perfect for participants who are nervous about their high ropes experience. While traversing a foot cable between two poles, the participant can use two hand cables for support and balance. This individual activity requires balance as the participant traverses the Rickety Bridge. What at first appears to be a solid span of steps across two cables is revealed to be a surprisingly wobbly bridge! This is a classic high ropes course activity. Overhead hanging ropes provide support for individual participants attempting to move across a horizontal cable. Ropes get further apart as the participant progresses. In this physically challenging individual activity, participants attempt to make their way from one end of the course to the other, balancing and swinging cables on suspended boards. Participants move across a series of hanging cargo nets and vines. This challenge requires balance and strength. Four climbers ascend a pole to a small platform, or come to the platform after crossing half of the Bosuns Steps. All four climbers join hands and lean outwards attempting to maintain balance for each other. The Catwalk Climb challenges two participants to climb together over a series of angled beams. A variety of rope ladders, climbing holds, and bean stalk components link each beam. This element requires partners to share space and work together. This is a variation on the classic “Giant’s Ladder”. Two climbers work together to ascend a series of suspended wooden beams. The beams get progressively farther apart, making this element a definite challenge. A 6’x 8’ cargo net in the final span will permit the climbers to finish the element by sitting on the top platform. In this multi-component climbing activity, two partners work together to ascend a vertical playground of beams, tires, cargo nets, and rope ladders. The Ring Thing is a visually striking element that features a suspended, inverted pyramid at the top of a long tubular cargo net. Two climbers ascend a series of wooden rings, climb up the outside of a tubular cargo net, and finish by conquering the inverted pyramid. From the top of the pyramid, climbers will be able to sit on the top platform of the Challenge Tower. A Tubular Cargo Net extends up the centre of the Challenge Tower. Participants can enter the Tubular Cargo Net and climb up or down on a belay. After being belayed up 36 feet to a platform, the participant is clipped to a pulley and then making a personal commitment, slips off of the platform and zips along an angled, 350 foot, overhead cable. The Flying Squirrel is an exciting single-person element that lifts the climber into the air. This element requires team of belayers and uses a counterweight belay system to lift, hold, and lower the climber. Participants leap from a fixed platform in an attempt to catch a suspended trapeze bar. The trapeze bar is adjustable, encouraging participants to set their own goals. Participants rappel down the face of the climbing tower controlling their rate of descent (while still on a separate belay as a back up system). This is a trust and commitment activity and is often used with leadership groups. Looking for an area to express your creativity and improv skills? Look no further than our Music, Drama and Dance sessions. 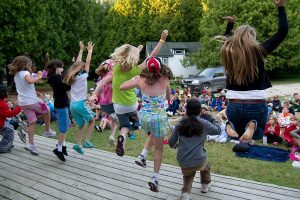 Whether it’s going on a musical adventure through the forest, practicing your stage combat skills, or learning a flash mob dance routine Camp Kintail Music and Drama provides a fantastic outlet for those creative souls and drama divas. What’s better then getting to spend time in the beautiful surroundings that Camp Kintail offers? Nature sessions at Camp Kintail take place in a variety of spaces around the camp site, and always offer the chance to enjoy the forests and fields. 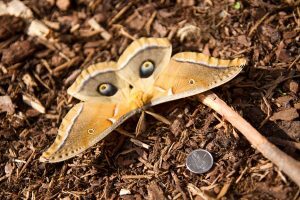 Whether it’s learning about earthquakes, visiting with the Camp Kintail bunnies and chickens, making recycled paper, learning about natural defences or understanding the world of our small critter friends, Nature sessions at Camp Kintail are an exciting time for any outdoor enthusiast. Ever wondered how to tie a perfect knot? Or how to make a cake in an orange rind? Outdoor Living Skills at Camp Kintail can provide the answers to these life-long questions. During Outdoor Living Skills, students will gain a variety of outdoor living skills that are useful whether you’re camping in your backyard, or heading out on a trip in Algonquin Park. We have 3 large playing fields that are regularly used for soccer and ultimate frisbee. We have a basketball court, beach and grass volleyball and the always popular gaga ball pit. In addition we have a variety of equipment for playing sports and games like baseball, and even croquet! The 100ft slide, or ‘The Shady Chute the 3rd’ has become an instant hit at Camp Kintail. Participants slide down the inside of a 3 foot-diameter tube sitting on plastic toboggans. It is silly, fun and exhilarating! Everyone who does it wants to ride it over and over. You can try out different toboggans, sitting or lying down, eyes closed, it’s up to you. What would camp be without boating on Lake Huron? Camp Kintail watercraft sessions provide students with the opportunity to practice both their canoeing and kayaking skills with a certified canoeing instructor and qualified lifeguard. They will not only learn about the different parts of a canoe and its accompanying paddle, but they will also learn about strokes and sterning a canoe. In addition they will also have the opportunity to try out our kayaks and have a try on our stand up paddle boards. On days where it’s too wavy for the boats to make it out, campers can try their best to ride out the waves and body surf. 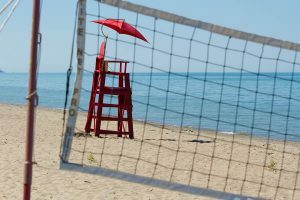 Situated on the shores of Lake Huron, Camp Kintail is fortunate to have a beautiful stretch of beachfront property, which the camp makes daily use of. The swimming area is marked with buoy lines and monitored by our qualified lifeguards. 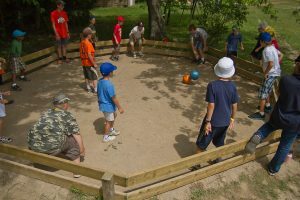 For participants who would like to do something else, Camp Kintail also provides a variety of sand toys for castle building, as well as beach volleyball facilities.